CEJA has been growing the environmental justice movement in California for the past 15 years. With an antagonistic federal administration at the helm, environmental justice communities are under attack and the very existence of climate change is questioned. CEJA is helping lead the resistance, and our work is more important than ever. With expanding opportunities to further build our movement, we put out a call for new leadership to strengthen and grow our alliance, bring renewed energy, ideas, and a bold vision to build on our success winning vigorous and innovative state policies that benefit and protect low-income communities and communities of color on the frontlines of pollution and poverty. After a rigorous search, CEJA Co-Directors and Steering Committee are pleased to welcome Gladys Limón as our first Executive Director. 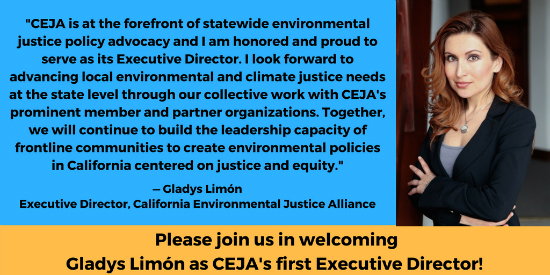 With over 15 years of experience in legal, policy, and community-based work for environmental justice and civil rights, Gladys brings a deep connection to CEJA’s members and partners. Born and raised in Oxnard, she experienced and witnessed first-hand the impacts of disproportionate environmental burdens in her community. Her social justice career started with the Ventura County Living Wage Coalition, now the Central Coast Alliance United for a Sustainable Economy (CAUSE), and a CEJA partner. Gladys’ work has ranged from supporting CAUSE’s work in defeating a massive liquefied natural gas facility project proposed off of Oxnard’s coast to developing legal strategies for EarthRights Int’l to oppose extraction projects in indigenous communities in the Amazon. Gladys has extensive experience working on behalf of immigrant communities, including as staff attorney at the Mexican American Legal Defense Education Fund (MALDEF), where she litigated cases concerning anti-immigrant laws, racial discrimination, and the rights of low-income immigrant workers. Most recently, Gladys has worked as an attorney at Communities for a Better Environment, one of CEJA’s core members, on successful high stakes environmental justice matters including the shut down of Exide’s battery smelter that for decades polluted surrounding communities with dangerous levels of lead and arsenic, resulting in one of the most serious environmental catastrophes in California. She has also helped lead the work of the Standing Together Against Neighborhood Drilling (STAND-LA) coalition alongside our partners at PSR-LA. Gladys brought an unprecedented environmental and civil rights lawsuit on behalf of Youth for Environmental Justice against the City of Los Angeles challenging the rubber stamping of oil drilling projects in neighborhoods, resulting in the City’s issuance of a robust administrative guidance policy that provides environmental and anti-discrimination protections. Gladys is also a lead attorney representing CEJA in the fight to defeat the Puente Power Plant in Oxnard, a fourth dirty fossil fuel plant proposed in a disproportionately impacted community. Gladys’ roots in movement work, her legal and policy expertise, and strong relationships with diverse stakeholders and decision-makers bring a significant skill set to this new role at CEJA and we are so excited to work with her to take our leadership to the next level. Please join us in welcoming Gladys Limón as our first Executive Director! The current Co-Directors, Strela Cervas and Amy Vanderwarker, are excited to transition their roles to further lead CEJA’s organizing and policy work. Strela will transition to Statewide Organizing Director and Amy will transition to Senior Policy Strategist. Gladys’ first day as Executive Director is August 24th.